The healthcare of the early 1900s is unrecognizable when compared to today’s innovations. In 1902, when the mineral springs near Sulphur, OK were set aside as park land, visitors flocked to the destination in pursuit of the supposed healing properties of the waters. During the New Deal, workers transformed much of the natural landscape into terraced terrain and sculpted spring wells. Now, in the 21st century, more advanced healing is facilitated near the park at the adjacent Arbuckle Memorial Hospital. Health Facilities Group immediately knew that paying homage to this rich history was the only way to do justice to this national treasure. In order to evoke the nearby mineral wells, curved structures project a sense of comfort and peace to visitors. In fact, the entire lobby is an outward tilting, elongated cylinder framed with windows stretching from floor to ceiling. Additional cylindrical structures positioned within the lobby further conjure images of spring wells. Wood, stone, and expansive natural lighting are also key elements of the design. After all, while natural springs may not provide the healing properties once believed, research has affirmed that incorporating natural beauty into design can facilitate faster healing and better patient experiences. The 50,000 SF Arbuckle Memorial Hospital features a fast-track emergency department with two large trauma rooms; 7 exam rooms; 25 private inpatient rooms; a surgery department; laboratory; radiology services; a specialty clinic; and outpatient services areas. The hospital serves more than 12,000 patients every year. 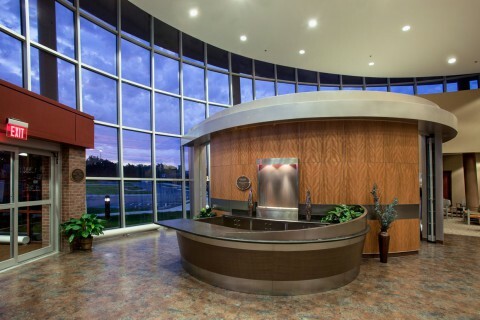 Health Facilities Group provided key services, including healthcare planning, space evaluation & programming, state-of-the-art medical design, site planning, estimating services, quality assurance inspections, construction phasing, and building information modeling.